Insomnia Energy Drink on dispense provides not only commercial benefit for the outlet, but also operational benefits such as speed of service, reduced wastage, portion control and greater profit. It provides a solution to suit the needs of your outlet and your consumers by ensuring that every delivered serve is as good as the next and tastes great. This premium draught energy drink has great taste and has wide appeal, just like the most popular energy drinks. The 10 litre bag in box saves pubs and clubs 70% or more per 250ml serving of canned energy drinks. It reduces stocking time, cooler space and waste. It mixes well with all the popular spirits, not just vodka and is ideal for Jager bombs etc. Makes selling by the jug much easier and more profitable. Offers even greater savings when bar staff only need 5-6oz of mixer. Each BIB will dispense up to 240 x 250ml can size drinks, that is the equivalent of 10 cases of red bull cans. Why pay for a can of energy drink that costs on average 65p-75p plus? With Insomnia, simply use what you need. 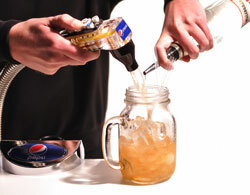 There’s no need to open a can, ensuring that each time you dispense a drink it will always be fresh and never flat. Your customers will love it and your sales and profits will increase. As the leading distributer of dispense soft drinks in the North East, supplying the highest quality branded products, supported by superb customer service and technical support, make the change to ABCO today.